We, at American Christian Tours, wish you and your family a wonderful Thanksgiving Day! Our blessings are abundant as we consider our family, which includes staff, vendors, and schools. God is so very good. Below is an article written by our Director of Education, Marshall Foster, which you may want to include in your Thanksgiving celebration. As our thoughts turn to Thanksgiving this year, it is a perfect time to recapture the true spirit of America’s Pilgrim ancestors. We are in a time of great trial, in many ways reminiscent of these faithful believers. It would be wonderful to share with our families and friends this Thanksgiving the following story of the amazing sacrifice of these brave forerunners of our freedom. As we shall see, it cost them everything to lay the foundation of the most prosperous and free nation in history. Will the strength of our character be tested like theirs was? The story begins in the small village of Scrooby as the Separatists (later called Pilgrims) began an underground church in the basement of a livery stable. These unlikely world changers desired to live a quiet life, raise their families and worship God according to the teachings of the Bible. But their biblical faith brought them face to face with the big government tyranny of their day. In 1607, the small Scrooby congregation sold all their possessions and tried to escape to Holland where there was a degree of religious freedom. They hired a Dutch sea captain. But once they were aboard his ship, he stole all that they had and turned them over to the king’s soldiers in the town of Boston, England. They were searched to their “innermost garments” and paraded through the streets. Then the men were dragged off to prison for nine months (which was often a death sentence). The women and children were left penniless and homeless on the streets. A year later these weary families were reunited. They attempted another escape by ship. As the men were on board the ship preparing to leave, they were forced by the Dutch captain at gunpoint to set sail and leave their families behind. The king’s troops came and captured the women and children on shore. They pleaded for mercy from the king’s men, but instead were thrown in prison for a year. They were finally released and joined their husbands and fathers in exile. Finally, the Pilgrim church was reunited in Holland and settled in Leyden. There for eleven years they enjoyed a degree of religious freedom. Their Cambridge trained pastor, John Robinson, was one of history’s foremost cultural reformers and Bible scholars. They learned from him what no other group of believers had ever put into practice. They discovered the secrets of civil, economic and religious liberty built upon the Bible and on 700 years of English Common Law. But the heavy hand of poverty laid hard upon these exiles. The Dutch labor unions denied the English exiles any good jobs. Many of their children were forced into heavy sweatshop labor. They were heartbroken as their children began to be influenced by the immoral culture around them. Finally, facing possible annihilation by a Spanish invasion, and having a deep concern for their children’s future, these faithful, tough pioneers decided to immigrate to the wilderness of America. They were facing almost certain death. But they chose to stand for the truth without compromise and for the hope that they and their posterity could experience liberty under God. As the Pilgrims set sail for America. They were facing almost certain death. But they chose to stand for the truth without compromise and for the hope that they and their posterity could experience liberty under God. As the Pilgrims set sail for America, one of their two ships began to sink. They had to return to England and only a select group of volunteers boarded the Mayflower and continued the voyage in August of 1620. Sixty six days later, facing almost constant gales, the ship arrived off the coast of Cape Cod. The November storms and the Cape kept the captain from steering south to New York, their intended destination (the place of the king’s Charter). Now without a charter, they formed their own government. 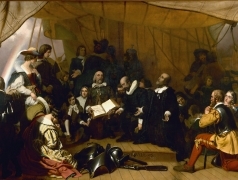 On November 11, 1620, forty six men gathered in the captain’s cabin and signed the Mayflower Compact. This was a government of the people – unique in all of history. It begins “In the name of God, Amen” and placed in the hands of the people the right to create laws and constitutions under God’s direction. This document became a basis for more than eighty colonial charters and covenants that laid the foundation for American’s Declaration of Independence and the Constitution. Then, by God’s divine providence, after eighteen days scouring the Cape for water, they found a little harbor and a spring fed stream. It had been cleared of the overwhelming forests because it was the former village of the Pawtuxet Indians. Sadly, they had all died in a great plague several years before the Pilgrim’s arrival. After coming ashore in the middle of a harsh winter, over half of the Pilgrims died by March of 1621. Most of the women died while protecting their children from the elements. They buried forty six settlers in common graves to disguise their weakness. The communal farming that had been forced on them by the merchants who had funded their voyage led to two years of near starvation. In the summer of 1623, they abandoned group socialism. Governor William Bradford gave each man a plot of ground to plant crops. In this biblical enterprise system, each man worked his own land which resulted in an explosion of productivity. But no rain fell in July and August to water the crops and they faced certain death. They then repented for having forgotten to give God the glory. They declared a day of fasting and prayer for God’s deliverance. A gentle rain came that day and lasted for three days, restoring their crops and saving their – lives. Governor Bradford declared a day of thanksgiving to God for His rain and provision. This story is the heart of our national holiday, Thanksgiving. This year, we face our own form of drought. Many Americans have forgotten that it was God who made America free and prosperous. Let’s share America’s story with everyone we can, including our representatives at all levels of authority. Let’s encourage a return to the God of our ancestors. Is it not time to remember what our Pilgrim ancestors knew and did and to begin to rebuild our nation under God – one individual, one family, one community at a time?